After purchase from Woodham Brothers, 61264 was moved by road in July 1976 to the Great Central Railway at Loughborough. So started a 21-year restoration project that was to cost over £230,000. The majority of the cost of the restoration was that of the boiler. Following its lifting from the frames and removal of asbestos insulation in 1978, the firebox was found to be badly wasted. In fact, both barrel and firebox were declared to be irreparable. Six years were spent trying to find someone to either build new ones, or who would be willing to repair them. Finally, the proposal from Pridham Engineering was accepted and the boiler moved to Tavistock for repair. Work continued for 10 years, as funds became available, until the repairs were complete. The boiler was returned to Loughborough in August 1995 and refitted to the fully restored frames in 1996. Following the passing of the statutory tests in February 1997, on 6th March that year the loco (in LNER guise as green-liveried 1264) moved for the first time under its own power in over 30 years. Twenty-two days later, with its paint still wet, the first passenger train, for shareholders and members, was hauled from Loughborough to Leicester North and back. 1264 was steamed at Loughborough throughout 1997 but in 1998 moved to Carnforth for Main Line certification. This was achieved on 28th March when, in appalling weather, it successfully hauled a 420-ton train from Carnforth to Carlisle over Shap. A Heritage Lottery Fund grant had been obtained by the Trust to assist with the costs of certification as well as outstanding items such as the new tyres for the driving wheels. In May 1998, 1264 was the star of London Underground’s ‘Steam on the Met’, appearing on the publicity posters for the popular event. However, the boiler suffered with recurrent leakage problems and was returned to Pridhams for further remedial work. Returned to Carnforth in 1999, the loco was re-assembled and visited the Keighley and Worth Valley Railway, before a further test run over the Settle and Carlisle line. 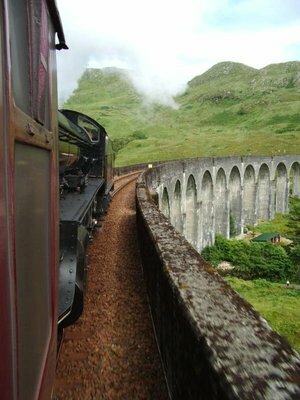 In 1999, 61264 appeared, for the first time, working the summer ‘Jacobite’ steam trips from Fort William to Mallaig on the West Highland Line. Repainted in BR black livery for the 2000 season, the loco worked the line for seven more summers, as well as visiting other preservation centres, including the North Yorkshire Moors, West Somerset, Churnet Valley, East Lancashire and North Norfolk Railway. The loco also appeared at the 2005 Crewe Works Open Day, as well as hauling 39 charter tours, amounting to 11,000 miles of main line running during this period. 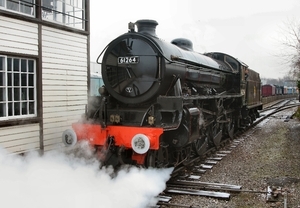 The locomotive was moved to Barrow Hill as home base during 2005. In 2007, 61264 worked on the North Yorkshire Moors Railway with through running to Whitby over the Network Rail ‘Esk Valley’ Line. In April 2008, the loco was taken out of service, prior to the 10-year overhaul, having run over 80,000 miles. 61264 undertakes test running on the demonstration line at Crewe Heritage Centre, following the completion of its £450,000 overhaul, 13th November 2012. Photo courtesy of Keith Langston. Following withdrawal in 2008, the loco was taken to the workshops of LNWR in Crewe where the boiler was lifted from the frames. 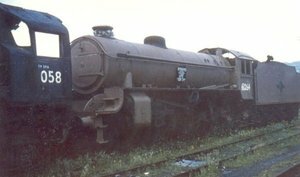 The tender and chassis were sent to Barrow Hill Roundhouse in Derbyshire. Over the next 4 years the boiler was comprehensively rebuilt, with most major components being renewed or replaced. The work undertaken, at a cost of nearly £450k, included an entirely new inner firebox, smokebox, smokebox door, tubes, tubeplates (front and back), stays, outer firebox sides, ashpan, throatplate, and one third of the firebox outer backplate. Meanwhile, many sundry jobs were completed on the locomotive chassis and tender at Barrow Hill Roundhouse. 61264 returned to steam and gave her first public train rides in the yard at LNWR Crewe on Saturday 27th October 2012. After a further period of fettling and testing, she returned to the North Yorkshire Moors Railway, which is now her long-term home, on Tuesday 20th December 2012. She formally entered traffic on 2nd March 2013.